1. Why do I need this book? Can't I find commentaries online for free? This book was actually designed to be used alongside the internet. This is why I don't provide plot summaries, or full filmographies of great actors or directors. I assumed that my Dear Readers were already regularly browsing the IMDb and miscellaneous remarks online. But you might find that only Claws & Saucers is consistently clear and accurate with what you want and need to know. Every entry was written with you - my fellow film fans - in mind. PLEASE TRY IT: read the excerpts and updates at this website. 2. What are the priorities in each entry? First, to describe each film accurately. Second, to set each film in historical or social context. Third, to summarize critical and popular reactions. Fourth, to suggest connections. And as for style, the aim was to be clear rather than cute. You will find something interesting - some idea, some reference, some connection - in every single entry. 3. Why is the book so expensive? Unless one chooses cheap newsprint paper, the cost of producing a paperback is very high. Claws & Saucers comes printed on quality paper, and it looks terrific. It's nearly 700 letter-sized pages - more than 650,000 words! If the price were lower, I would lose money on each sale. The struggle for a writer is to break even. However, all electronic versions are priced far lower than the paperback. 4. Are the electronic versions easy to navigate? Your e-reader should automatically generate a clickable table of contents, clickable to each letter of the alphabet (and more). The Kindle version has an extra TOC just in case. 5. Is it really complete? It's the most complete guide yet written. No other single guide comes close. In my Introduction (see Excerpts posted here), I mention just a few types of films not covered in the book. 6. I found an error or omission. Do you want to know about it? Yes, if you don't mind. Perhaps you can send me an email. I plan to update the volume as necessary. I also post corrections and additions on Facebook and on this website's "Updates" page. With your help, Claws & Saucers can get even better. 7. Do you have plans for sequels? Yes! The first sequel is FANTASY FILMS OF THE 1980s. Additionally, I post new entries on Facebook and occasionally on Forces of Geek. "Thank you for browsing these excerpts, fellow film fans. 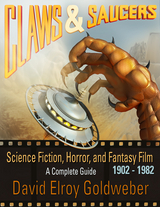 Claws & Saucers is your companion - not just for a few months or a few years of viewing, but for a lifetime. If you enjoy Claws & Saucers, please tell a friend." ... "Like" the C&S Facebook page to receive updates, reflections, links, and surprises.